What we appreciate in others is exactly how we should behave ourselves. Think about what you appreciate about other people. 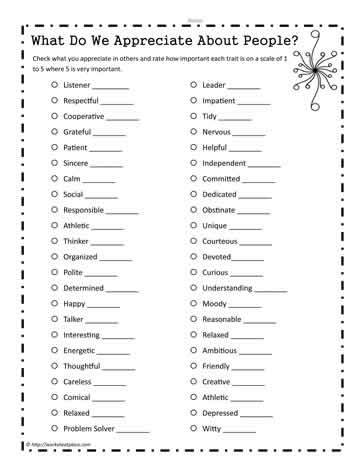 Make a checklist of all the things that are important characteristics for others to have. We should also try and live by these same standards. Here is a list of how we often appreciate others: cooperative, grateful, patient, sincere, calm, social responsible, athletic, thinker, organized, polite, determined, happy, talker, interesting, energetic, thoughtful, careless, comical, relaxed, problem solver, leader, impatient, tidy, nervous, helpful, independent, committed, dedicated, unique, courteous, devoted, reasonable, moody, friendly, ambitious, athletic, depressed. What characteristics do you appreciate? Which ones don't you appreciate?